BRITONS could pay to retain the benefits of European Union citizenship after Brexit under plans being considered by MEPs. The European Parliament’s lead Brexit negotiator Guy Verhofstadt said he supported the principle of the idea, which would see UK citizens sending an annual fee to Brussels. The former Belgian prime minister said Britons who voted Remain did not want to sever their links to the EU. MEPs will vote on the proposals by the end of the year, but any Brexit deal with the UK would have to have the agreement of the leaders of the other 27 EU nations as well as the parliament. Brexit-backing Tory MP Andrew Bridgen warned that Brussels would attempt anything to prevent the UK leaving the the EU. He told the newspaper: “It’s an attempt to create two classes of UK citizen and to subvert the referendum vote. 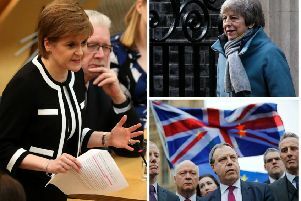 Meanwhile, the Scottish and Welsh governments have set out their legal objections to Mrs May triggering Article 50 - the formal mechanism for leaving the EU - without seeking parliamentary approval. The UK Government has appealed to the Supreme Court after judges ruled that MPs must be given a say before she can fire the Brexit starting gun. But Scotland’s Lord Advocate James Wolffe QC will argue that the consent of Holyrood should also be required before Mrs May can notify fellow EU leaders of the formal start of the process. In a written submission to the Supreme Court, he said triggering Article 50 “cannot lawfully be made by an exercise of the prerogative alone” would require an Act of Parliament and would also require the legislative consent of the Scottish Parliament. Counsel General for Wales Mick Antoniw echoed those views in a written statement, stressing that he was “not seeking to reverse the referendum result” but a new law would need to be passed at Westminster and Mrs May could not “short circuit” the requirement for the devolved institutions to give their consent. The Supreme Court has also given permission for pro-Brexit group Lawyers for Britain to file written submissions on the case.